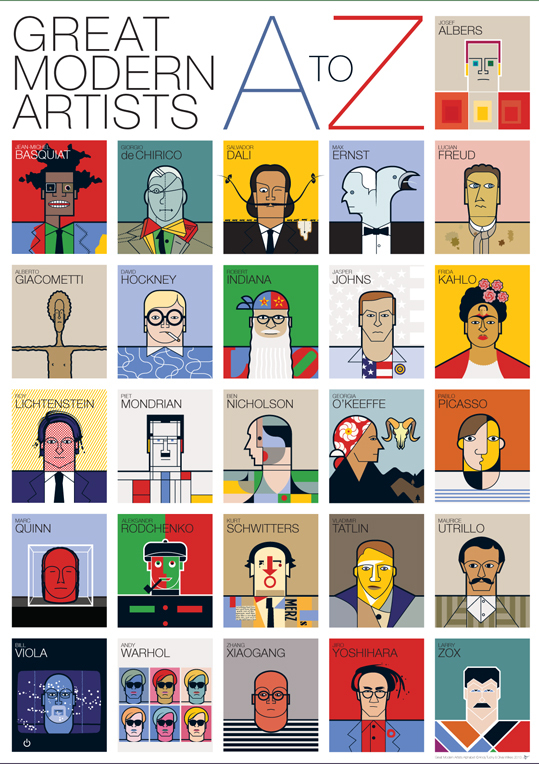 Andy has designed an alphabet celebrating some of the worlds best known and important international artists of the last 100 years. Each artist’s portrait reflects their work or image. The poster is now available from our website and measures 50 x 70cm. Why have one artist on your wall when you can have twenty six for only £12.95 plus p&p. Available from: http://www.andytuohy.co.uk/collections/posters That’s right, it’s not just our copywriting that’s cheap! Twenty-six Modern Artists Form the Alphabet in this delightful print from Andy Tuohy. Where can I purchase this poster? It’s awesome? Hi Laura I haven’t been blogging on this site for ages and just caught your comment. If you go to my website you will find it for sale there. It isn’t at the £12.95 as listed anymore though. You may have already bought it. Hope this helps.